So here's the deal, a real scoop in fact: Life. After. 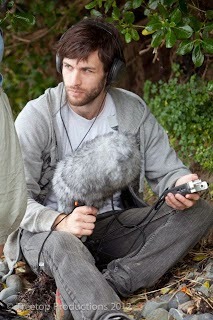 scored - 'scuse the pun - the incredibly talented and hot-in-demand Tane Upjohn-Beatson as our sound designer/composer. Just check out some of his previous work! Tane is a Wellington based composer and sound designer working in theater and film. He also performs regularly as a live accompanist for improvised theater. He has worked on over forty NZ plays and films, receiving Chapman Tripp nominations for the Constance Scott Kircaldie Outstanding Composer of Music Award in both 2009 (A Most Outrageous Humbug) and 2010 (Katydid), and the Park Road Post Production Sound Designer Of The Year Award in 2011 (The Engine Room), and a Chapman Tripp win of the Critics Choice Award for improvised musical 'Vance Fontaine: Command Performance' in 2012. Thank you, Tane, for coming on board! I can't wait to hear what the show sounds like!